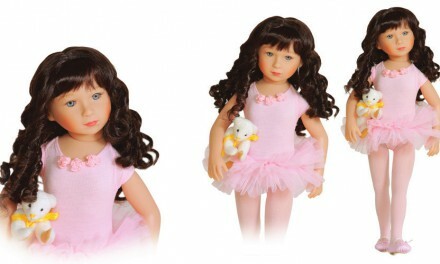 I love this time of year when all the dolls and bears that have been ordered for Christmas are arriving in store. Our poor postman however, didn’t look too impressed when he turned up this morning, looking ‘like a drowned rat’ in the pouring rain with our latest delivery from Kidz and Cats. I have been eagerly awaiting this delivery because it contained the newly released doll ‘Miu’ so I dropped what I was doing to straight away to unpack. 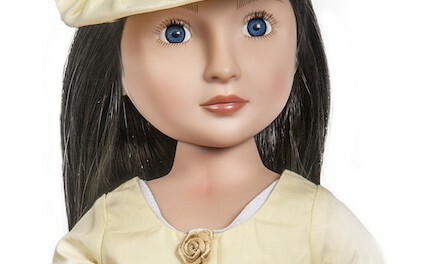 She was worth the wait – I just love this dolls face. She wears a such a playful pout which lights up her adorable face. Her jet black hair frames her face in a refreshing short bob style. Her black tutu skirt, knee length boots and a bright pink cardigan bring this delightful doll to life with a modern twist that Kidz and Cats are so good at. With her signature cat dressed in a matching pink outfit, Miu’s chic style is thoroughly modern and current, enough to brighten up even the wettest of days! I am sure that Miu is going to prove very popular and there are going to be some very happy little girls this Christmastime.